MIAMI, Florida (CNN) -- A newspaper advertisement for a Miami car dealership reads more like a coupon for bags of potato chips: "Buy one, get two!" It's estimated that 900 automotive dealerships will have shut their doors by year's end. The ad speaks to the desperation of car dealers as Big Three auto manufacturers beg Washington for billions in bailout dollars to combat sales that keep dipping to all-time lows. "The first thing people think when they come in is, 'It's a fake ad. It's a normal car dealer ad. It's a gimmick.' But it's not," said Ali Ahmed, sales manager at Rob Lambdin's University Dodge in Miami. To be fair, there is a catch to the buy-one-get-one-free offer: You must first buy a new Dodge truck at full retail price before you're eligible to receive a second truck for about $3,000 in tax, tags and dealer fees. "We've been fielding phone calls and e-mail inquiries from every state in the country looking to get this buy-one-get-one deal," Ahmed said. About 700 dealerships, most of them selling cars from U.S. automakers, have shut their doors since the beginning of the year. The number is expected to hit 900 by year's end. Last month, National Automobile Dealers Association Chairwoman Annette Sykora told the House Financial Services Committee some 19,700 dealerships will still be around by the end of 2008, compared with 50,000 in the 1940s. Sykora, a third-generation car saleswoman who sells Big Three automobiles at dealerships in Slaton and Levelland, Texas, said she recently sat down with the superintendent of Slaton schools. "We started discussing what would happen if the dealerships in my hometown were to close," she said during her November 19 testimony. "The loss of tax revenue would force them to cut programs and teachers. Commentary: Can the Big Three survive a bailout? 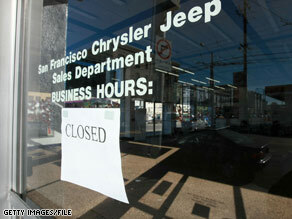 "Many displaced dealership families might have to leave town in search of work in other places, compounding the loss. This same scene would play out in hundreds of communities in the U.S."
Dealerships, Sykora explained, are independent businesses, not arms of the automakers. They invest in land, equipment, buildings and take out millions of dollars in loans to put the vehicles on their lots and showroom floors. She also said car dealerships are a prime source of advertising revenue for local media, they support charities and Little League teams and they are integral to the tax base, she said. With the world's economy reeling, expensive items like cars are not high priorities for families and businesses. It doesn't help that the credit crunch is making it difficult to get loans, which the majority of U.S. consumers need to purchase vehicles. Also compounding matters is consumer confidence, which hit an all-time low in October and didn't improve much in November, according to the nonprofit Conference Board, which maintains indices on consumers' trust in the marketplace. According to Autodata, car sales have plummeted since last year. In the United States, the number of sales of passenger cars and light trucks in November 2008 was down 36.7 percent from November 2007 -- from about 1.18 million to 747,000. Also, as of November 2008, automakers had sold about 12.35 million cars and light trucks, compared with 14.76 million during the same time period last year -- a drop of 16.3 percent, according to Autodata's summary of U.S. light vehicle retail sales. Comparing November 2008 sales with those in November 2007, Autodata reported that General Motors saw a 41.3 percent drop, Ford a 30.5 percent drop and Chrysler 47.1 percent. But it's not just U.S. automakers taking a hit: Toyota's vehicle sales declined 33.9 percent, Honda's dipped 31.6 percent and Nissan's dropped 42.2 percent during that time period, Autodata reported. "It's definitely a tough climate right now," said Matt Lee, floor manager for Major World Auto in New York. "A lot of people are saying it's a perfect storm of gas prices and financing and consumer confidence." Major World Auto used to sell about 150 cars a month. It now sells about half that, Lee said. And of the 15 to 20 salespeople who used to roam the salesroom floor, about 10 are left, he said. "Salesmen actually just walked out because they're not making enough money to support their family," he said. Major World has stopped bringing in new models because it can't sell the cars it has. Like University Dodge in Miami, it is resorting to some creative sales pitches, including zero-percent financing for 72 months and rebates of up to $7,500. But even with the bargains, car dealers are having trouble getting customers into the showrooms. In a recent CNN visit to Major World, which lasted about two hours, only one customer walked onto the lot -- to browse. "Where you would see five people a day coming in to at least look at a car per salesmen, you're getting maybe one person a day or two people a day," salesman Jamie Krinsky said. If the Big Three file for bankruptcy, Sykora told Congress last month, sales and confidence will continue to plummet. The government can help boost auto sales in many ways, Sykora said, citing two proposed tax incentives: one that would make interest payments on car loans tax deductible and another that would encourage consumers to upgrade their older cars for more fuel-efficient models. "Cash for clunkers" programs are in place in Texas and California, she said. "Whether it's my dealerships in Texas or it's the dealership in your community, the fact is local dealerships will be a major factor in our economic recovery," she told the House committee. "To get the economy back on track, we must restore consumer demand, and the only way to do that is to restore consumer confidence." CNN's Alina Cho and Eliott C. McLaughlin contributed to this report.